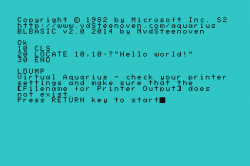 BootLoader BASIC is the answer to two requests on the ATARIAGE forums; To be able to start BASIC programs when turning on the Aquarius computer just like a cartridge and to have the most common used machinecoded routines available. 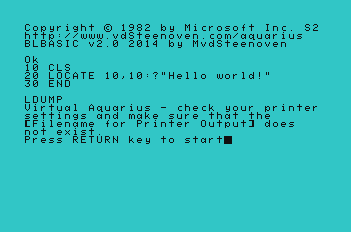 After experimenting with a script to convert a .CAQ file into a .BIN file, BootLoader Basic v2.0 is now the new version to create bootable BASIC programs on the Aquarius. Together with the Virtual Aquarius, BLBasic provides a complete environment to create, test and dump your BASIC programs. All these commands can be used in your own ROM file as well. Load the BLBASIC.ROM in the Virtual Aquarius. Next load your BASIC program by typing, quick type or loading cassette. IMPORTANT: Before pressing RETURN check the Virtual Aquarius printer settings! Go to Configure -> Printer and configure the "Filename for Printer Output"
Rename the output file extension from .txt to .rom or .bin and load the file into the Virtual Aquarius. NOTE: After the LDUMP statement the created ROM will be in a "STATIC" or "FINAL" state and cannot be changed. Any changes should be done against the original source code (cassette file or quick type text file). Thank you, Martin! I'm glad to see you back with a new Aquarius project; I'm finally finding the time to get back to it myself. Good choice on the new commands: being able to copy and move arrays of characters and do four-direction scrolling opens up lots of exciting possibilities. I'll give this a try next week! Hopefully more people will give programming on the Aquarius a try now.It has never been any easier to make some nice things happen in Basic. Bravo on this, great stuff. PSET reported a bug with BLBird. Turns out if you start Virtual Aquarius and start immediate a ROM created with BLBASIC (like BLBird) it will report a FC error when a PUT command is used. If you start Virtual Aquarius, load BLBasic v2.0, press ENTER, and then load BLBird -> everything runs fine. In other words, the PUT command was not correctly initialised in BLBoot modus. 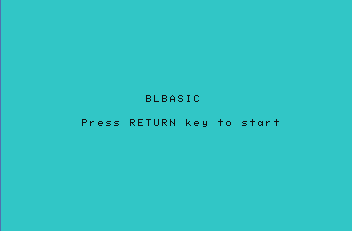 This is a bugfix v2.1 for BLBasic, it only contains the ROM and source. 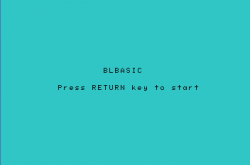 Please use BLBasic v2.0 for the manual and examples. If you type "Scroll Left" Or "Scroll Right" or even "Scroll bob" etc and hitting return causes the screen to goe black. You can type CLS in the black screen mode to recover your Aquarius, but we lose bug hunting details. Oh never mind that SCROLL bug, I see its setting SCR OLL and OLL = 0. Changing background color is a handy function. Indeed, the Aquarius BASIC interpreter doesn't need spaces between commands and/or variable name. It recognises SCR as the statement but didn't recognize OLL and asumes it is a variable (OL as Aquarius only accepts 2 letter variable names). So this is standard behaviour.